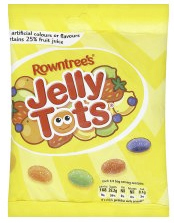 Rowntree Jelly Tots- Too Good to Be True! You know how fond I am of the Fruit Pastilles, and now they come in teeny, tiny form, and bagged for convenience! The same flavors are available, and there are lots of the black current which is my favorite. There are a few draw backs to these candies…one is that there is lots of sugar at the bottom of the bag making it messy, two is that they are so small I can eat more than I should in a short time. I found these in the imported foods aisle at the Star Market in Central Square, Cambridge, MA. I will seek these out at any grocery store I visit, or I’ll order them online. If you see them, pick up a bag and you’ll be glad that you did.